Imagine a tree, a mature gum tree or bottle tree, and you’re standing 50m away looking at the entirety of it. Now imagine you move closer and are looking at one of the larger lower branches. You might notice a similarity between the branch and the whole tree. Now pretend you’re climbing up the tree and looking at one of the smaller branches or even the leaves. Again you might notice a property that’s often used to describe fractals—self-similarity. In essence, each view of the tree presents a similar pattern, just at a different scale and maybe a different orientation. That is a pattern in nature that is like a fractal. Fractals are sometimes termed as the geometry of nature, but this isn’t quite true. Generally, a fractal is a mathematical model that nature approximates. Fractals can be found everywhere—stream networks, our system of blood vessels, snowflakes, lightning bolts, clouds, snail shells. The list goes on. But fractals are not just mathematical functions or something interesting to look at when on a hike. Fractals are applied in science, technology and industry and their use pops up in some surprising ways, from ecological identification and quantification to assessment of disease to analysing trends in the stock market! Below are some images of fractals and fractals in nature. 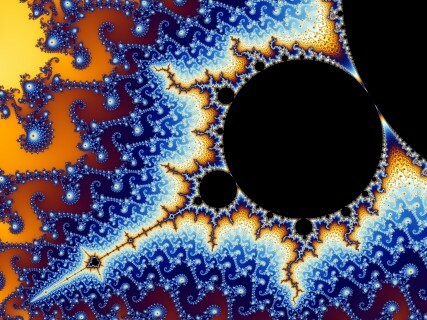 If you’d like to learn more about fractals, you can simply google fractals. Here’s one website that provides a little applet for creating a fractal. There are many others out there as well.